As with any story when written from memory my column last month contained at least one error. I told you that Tom Siddall lived in a house located behind what is now the Port Maitland Sailing Club. Tom did live in a house along the river but it was in the area where Terry Powell now has his shipyard. The fellow who lived in my errant house was named Sam Dils. Sam was a bee keeper with a few hives on his property which he named Snug Harbour. Sam is remembered by some for his tiny three horse motor boat which he would motor down river to the Exchange Hotel for a few drafts. After tossing down more than his share he would walk home and go to bed. The next morning he would ask around Port for his lost boat. Soon he would find it just where he had parked it the previous afternoon. Sam was a brother-in-law to Milan (Milo) Culp, the well known boot-legger, rumrunner and fisherman from Port Maitland. I have not written in my column about Milo, and his exploits into the legal and sometimes not so legal aspects of his career, but I will! Let us now slip across the river to the east side and correct one other item. This one is from my March column. I stated; “All that remains on the east side of the Grand River photographed in 1929 is the old house on the hill which once belonged to my grandfather, now called Chateaux Côté and another building, the home of the late Tom Spray, today owned by Bernard and Shawn Desmarais.” In fact, there remains a cottage along the river which was built in 1905, by Tom Harris and D. (I believe Doug) Lockhart of Stromness. This cottage now belongs to Jim and Sandra Gill of Hamilton. Across the Feeder Canal beginning at its mouth were three fish companies. The one closest to the river was called the Independent Fish Co. and was owned by Jack Mossip and George (Shorty) Gorral. Next to the Independent was the Port Maitland Fish Co. owned by a group of Port Maitland fishermen including Percy Siddall, George Little, Stephen McKeown, and Jack McKee. These men chose to pack their fish as a collective, much as they did years later at the Port Maitland Fishermans Co-op. 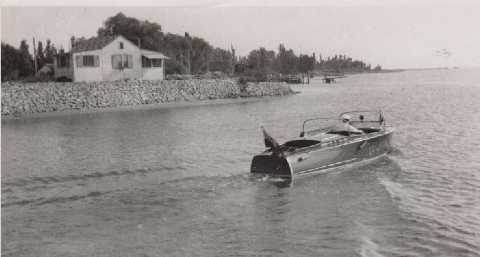 A third fishery was built and owned by Benny Crumb (Circa 1921). Unfortunately Benny ran into some difficulties and within a year or two sold his fishery and briefly moved to the United States. For a time brothers Harry, John and Bill Siddall took over the Crumb fishery. A fourth fish company (located on the river near my grandfather’s former cottage) was the Charles Ross Fisheries also known as the “A. Booth Syndicate or Trust (1884) of Buffalo.” By the time 1929 came around this fishery was owned by Ed Martin, son of Ed Martin senior owner of the Exchange Hotel. The Booth Fisheries could still be found in the yellow pages in Malton Ontario as late as 1990. I do not know what year but it was in the early to mid 1930's that brothers George and Lorne Siddall owners of the tug G & L located their business on the south side of the canal beginning the exodus from the north side. There had been a number of fires on the north side which destroyed some of the fish-houses and the TH&B was pressuring the fishermen to move from its property. Opposite Brown Point, was Robinson’s Point, named for George and Jenny Robinson. Jenny descended from the Sundy family of Attercliffe Station. Here was the docking facility for the TH&B Navigation Company’s car ferry Maitland No. One. It was here that the Maitland No One loaded and offloaded her 28 railway cars usually containing coal from Pennsylvania, via Ashtabula Ohio, destined for the steel mills in Hamilton. On the north side of this dock was a small yet intriguing piece of land. What is intriguing is that on this tiny fragment of river front. the east pier at Port Maitland and Port Colborne piers were built, then floated into place. It is from examining this piece of land I am reasonably able to date this photo. The piers were constructed during the years from 1927 to 1929. As there is no sign of construction taking place in this photo and the east pier is still in one piece, I know the photo was taken late in summer or early fall of 1929. The brake in the pier opened on February 25, 1930. Thus, 1929! Further to the north we can see the coal slip where the other ships bringing coal from Pennsylvania and Ohio docked to unload. At first they were emptied by a clam shovel, then with the onset of self-unloaders the ships crews handled the task themselves. As with most of the items mentioned in this series, I have barely touched on the facts of these interesting landmarks. I will revisit them in future articles giving you much more to ponder. If you have items you wish written about or pictures you would be willing to loan, please drop me a note. Let me know how you feel about these articles.